When I pulled the Aprica Presto stroller out of the box, it was apparent that this one is sturdier than most “lightweight strollers”, no rattling or “tin”-iness about it. It assembled easily and quickly by snapping the wheels into place and unfolding it required a simple pull up on the handles (though intuitively, I kept wanting to push down) and a push down of the locking mechanism with a very few opportunities to pinch yourself in the process. The canopy is thoughtfully designed providing generous cover (the pop out sun visor is a plus) from the elements with a hidden window for ventilation and view of the little one. The seating is positioned nice and high allowing easy access to the basket below and making it a little easier to place and pick up my child. The seating reclines fairly significantly with a pull of a strap and a release tab. The 5-point harness is adjustable, sturdy and simple to clip together with plenty of strategically placed padding for my child’s comfort. The only tricky aspect of this stroller is making sure that the front wheels are locked in the correct position before folding it up. Otherwise, it will not stand on its own. 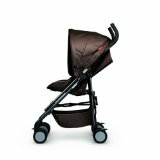 The Aprica Presto is very well designed and visually appealing (comes in four stylish colors: tea leaf green, loft brown, metro orange and highrise grey) “lightweight stroller” that is simple to operate and sturdy. This product gets my recommendation. By the way, a very nice raincover comes included.